Ohio buckeyes photo © Jim Crotty (used by permission). 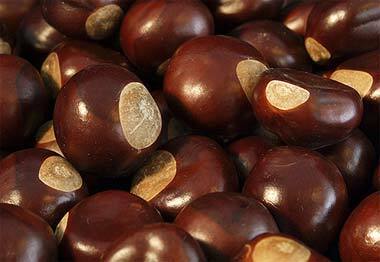 The name "buckeye" stems from Native Americans, who called the nut "hetuck," which means "buck eye" (because the markings on the nut resemble the eye of a deer). But the national association between Ohio and the buckeye was born during William Henry Harrison's 1840 presidential campaign (Harrison was a Virginia-born Ohioan and military hero). Harrison's opponents claimed he was "better suited to sit in a log cabin and drink hard cider." Harrison's supporters turned this intended criticism into a promotion, dubbing him "the log cabin candidate." They fashioned Harrison's campaign emblem as a log cabin made of buckeye timbers with a long string of buckeyes decorating the walls (Harrison's backers also walked with buckeye canes and rolled whisky barrels in parades). The campaign gimmick was successful and Harrison ("Old Tippecanoe") beat President Martin Van Buren's bid for re-election. Ohio has since been known as "the buckeye state" (the buckeye is also Ohio's official state tree). 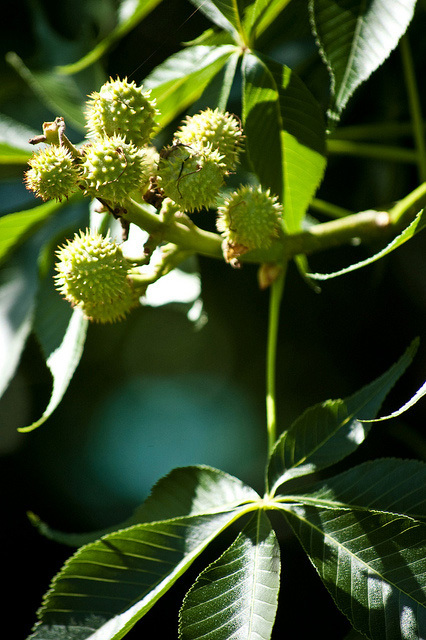 Buckeye pods on Ohio buckeye tree; photo by Tau Zero on Flickr (noncommercial use permitted with attribution / share alike).